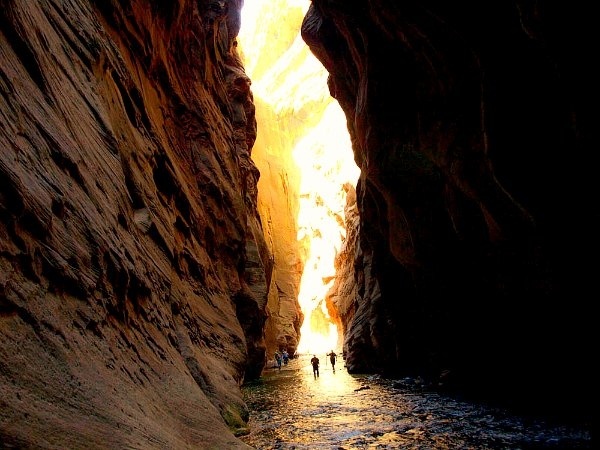 The Narrows hike in Zion National Park is one of the most beautiful and different hikes in the desert southwest of the United States. 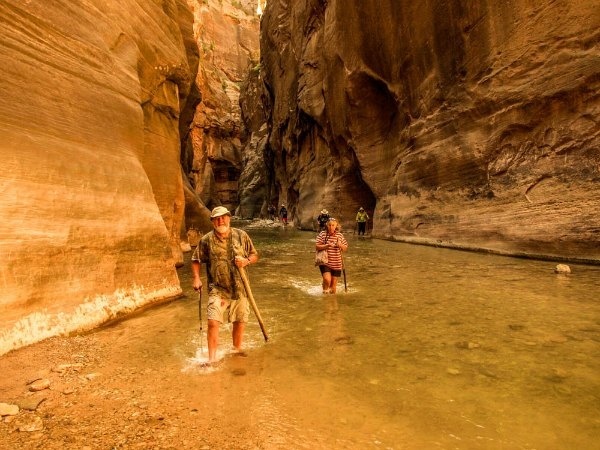 On most hikes, you are trying to keep your feet dry, but in The Narrows, dry feet are not an option as you are actually hiking in the Virgin River. The towering walls stretching up 1000' on either side of you makes the hike well worth it though, and as the day heats up, the cool water and shadows of the canyon can be very pleasant indeed. We started off early to beat the heat and the crowds and travelled up Zion Canyon from our campground on the free shuttle bus. Providing a clean, comfortable ride and causing less pollution and congestion, many parks are moving to shuttle systems as part of a Responsible Travel initiative. Our bus took us past the fabulous Court of the Patriarchs and Angel’s Landing before letting us off at the end of the line, the Temple of Sinawava. 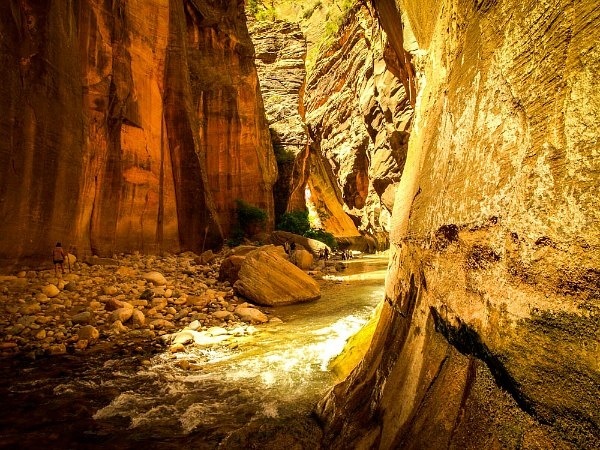 The first mile of this hike is along the wonderful Riverside Trail. It is a simple, relatively flat walk along the river’s edge allowing walkers to catch a glimpse of mule deer or the colorful Steller’s jay. But it is where this trail ends that the real adventure begins. There is no avoiding it, so the best way is to jump right in and get your feet wet. From there, the canyon quickly narrows and we soon found ourselves shrinking into insignificance as the walls stretched up to meet the sky. Sometimes we walked on dry land, and sometimes we were up to our waists in the river! Passing lush vegetation and some beautiful small waterfalls, we continued up the canyon. Around every turn, there seemed to be another “must-take” photo stop and another view that simply took our breath away. After hiking two hours up the canyon, we stopped on a dry, sunny rock for lunch. We eagerly discussed the hike. Peter called it a “deeply spiritual place” and Carmel said it is “right up her alley, adventurous and beautiful”. Finishing our lunch, we turned around and started making our way back down the canyon. By that time, the sun was up a little higher and the colors had changed. While we hiked out the same way we hiked in, it seemed like a different hike entirely. When we finally reached the end of The Narrows and once again set off down the Riverside Walk towards camp, we were all a bit tired from our walk, but each of us had a smile on our face. 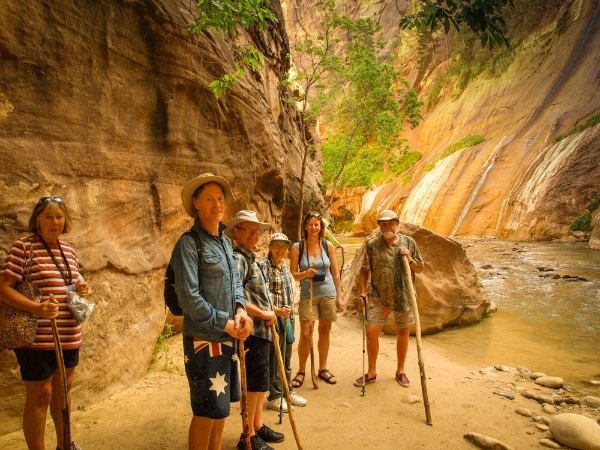 We all knew that we just made a very unique and beautiful walk through The Narrows in Zion National Park, and created a memory we will not soon forget. If this is the sort of adventure that you think you would like, then why not join us on our National Parks Walk tour and experience some other equally amazing national parks.